If you use Mail and organize your messages into folders, you might find that some of your folders have a white folder icon, while others have a blue folder icon. For instance, if you’ve ever imported messages into Mail, they wind up stored in a white folder named Imported. And yet, if you create folders on your own, they’re blue—usually. 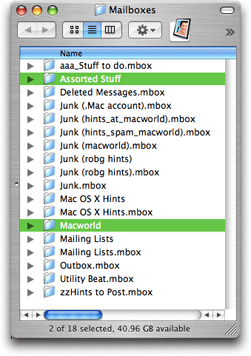 Although it may seem random as to which color winds up on which folder, there’s actually a method to the madness…and believe it or not, it’s actually covered in Mail’s help file. As explained in Mail’s help, a white folder can only contain other folders, not individual messages. Blue folders, on the other hand, have no such restrictions. So why is a given folder white or blue? This is going to sound a bit strange, but a given folder in Mail is white if it doesn’t exist. I know what you’re thinking—“It must exist, I can see it!” And that’s true, it does exist. But unlike the blue folders, it doesn’t exist as an actual mailbox folder; it’s simply a folder. You can see this for yourself in the Finder. Navigate to your user’s Library -> Mail -> Mailboxes folder. You’ll see an entry for each top-level folder you have in Mail. If you have any white folders, you’ll see that the folder’s name lacks the .mbox extension—this means that it’s just a folder, and not a real mailbox. As such, that folder cannot be used to store messages, since it’s not a mailbox, but it can store other folders. 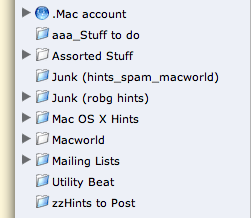 For example, below left is a section of my folder list in Mail; to the right is the list as seen in the Finder. The two green-highlighted entries correspond to the two white folders in the leftmost image. Notice that neither folder has the .mbox extension. The blue folders, on the other hand, do have the extension, and can be used to store both messages and folders—they are true mailbox folders. So now that you know what it means when you see a white folder, how can you create your own? And why might you want to use them? White folders are nice because they prevent you from misfiling a message during a drag-and-drop operation—you can’t accidentally drop the message on the top-level folder, as it won’t accept the incoming message. Alternatively, you might want to use white to call out a folder or two, since Mail won’t let us assign colors to folders. (That’s how I use them.) If you want a white mailbox folder, there are two ways to create them: the easy way and the not-quite-so-easy way. Click OK, and you’ll find a new white top-level Vacations folder in your list of mailboxes, with a normal blue 2006 folder within it. You can now move folders into and out of (or create new folders within) the Vacations folder as you see fit. Another way to create a white mailbox is to delete a mailbox. Huh? Using the same example as the easy way, first create a new Vacations mailbox. Notice that it’s blue, meaning it can hold both folders and messages. 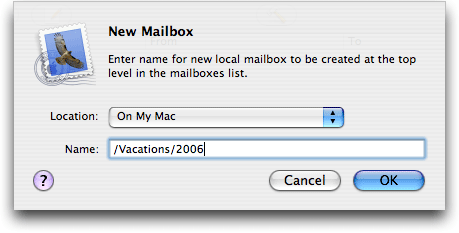 Now select the Vacations mailbox, and create the 2006 folder within it—the folder will automatically be saved there, since you’ve selected the Vacations folder first. Notice that it, too, is blue. Obviously, the first method is easier, but the second does work, and might actually be a bit simpler if you’re building white folders that are deeply buried in an existing folder structure. So there you have it—the low-down on what the blue and white Mail folder icons mean, and how to create white icons of your very own.